Find out the source of the special offers available in the Pawnbroker's shop. Find Ahnia in the Bazaar Sewers. Either attempt to read the note next to her or speak to her about Weerhat and kill her. Pick the note up off the ground. 'Ten-Tongues' Weerhat in the Pawnbroker's shop in the Great Bazaar will offer you some special offers on cheap wares. Ask him why the wares are so cheap and, if his disposition is high enough, he'll tell you that he gets them from Ahnia in the sewers. 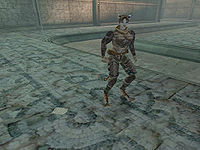 Ahnia can be found just inside the sewers in the southeast corner of the Great Bazaar, standing next to an unsigned note on the ground mentioning a particular book. If you try to read the note or mention Weerhat to her, she'll attack you. Kill her and take the note. Confront Weerhat about the late Ahnia and he will confess that she also gave him a stolen book which he will pass onto you. The book is not decipherable, but you do recognize the name Elbert Nermarc from it. Elbert Nermarc is the enchanter working on the top floor of the Craftsmen's Hall in the Godsreach district. Talk to him about the stolen book and he'll glady accept it back, saying it has a number of important formulas in it. As a reward for returning the book he'll offer you a small discount on anything he sells. Once finished the quest, it's possible to buy the book back from Elbert. For those of you collecting books, it's possible to get two copies of Elbert's notes; steal it from Ten-Tongues before beginning the quest, then complete it as usual and the game will add another copy to your inventory upon completion without checking to see if you've already acquired it. After returning the stolen book, you can buy it back to get the second copy. Killing Ahnia will, of course, stop the flow of goods for Ten-Tongues's "special offers". You may want to weigh up which is better for you - his scrolls or Elbert's wares. As long as she is alive, Ten-Tongues sells three types of spell scroll for 60 drakes each: Scroll of Hellfire, Scroll of Illnea's Breath, and Scroll of The Fifth Barrier. In addition to the Disposition increase, the reduction in Nermarc's prices is achieved by lowering his Mercantile skill to 5. Talking to Weerhat after completing the quest will set his base Disposition towards you to 40, even if it was lower than that before. 10 'Ten-Tongues' Weerhat has suggested that I should stop in occasionally to see if he has any special offers for me. 20 When I questioned 'Ten-Tongues' Weerhat about the scrolls he offers at discount prices, he mentioned someone named Ahnia, but wouldn't say more. 30 'Ten-Tongues' Weerhat admitted that he's been involved in some shady business with a Khajiit named Ahnia. She can be found in the Sewers underneath the Bazaar. 40 I confronted Ahnia about the scrolls, and she attacked me. I was forced to defend myself, and killed her. 50 I found a note suggesting that Ten-Tongues Weeraht has a stolen book in his possession. I should speak with him about it. 60 When told of Ahnia's death, Weerhat confessed to knowing where the scrolls came from. He gave me a stolen book he'd been asked to sell, and begged me not to kill him. 100 Finishes quest I returned Elbert Nermarc's book to him, for which he thanked me, and offered me reduced prices on his goods. This page was last modified on 10 December 2017, at 21:36.